Alright. So here we have Sweden's Starblind with their sophomore effort, Dying Son, and my first turn with the band. The synopsis at the start: Starblind plays traditional heavy metal, the New Wave of British Heavy Metal variety, trying to channel a whole lot of early Iron Maiden. The question is to they succeed at either. Yeah. Pretty much, at least for the former. The Starblind sound is fundamental heavy metal. Twin guitar harmony and leads, perhaps their strongest asset. 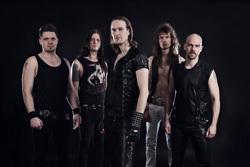 A gallop to their rhythm section which puts the speed into their metal for echoes of that nascent power metal sound. The drumming is tight and, thanks to some fine mixing and mastering, the bass line is a strong presence. As for the vocals, Mike Stark sings clean and melodic. I think he's trying to channel Dickinson, even express some of his own versatility. But mostly he sounds like a rabid and out of control Tobi Sammet (Edguy), especially when he goes screamo. Which is a lot of the time. Most of the time you can't understand a word he's saying. Honestly, I wanted to skip those parts or simply wished Starblind had another singer. Otherwise, for pure classic "keep it true" metal, the music is pretty terrific, spot on stuff. Firestone, The Man of the Crowd, Sacrifice, and the longer The Land of Seven Rivers Beyond The Sea are fine examples. By way of conclusion, if you dig classic metal like the New Wave of British Heavy Metal and can forbear some screamo vocals, you should check out Starblind and Dying Son. 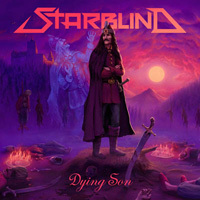 If you dig classic metal like the New Wave of British Heavy Metal and can forbear some screamo vocals, you should check out Starblind and Dying Son.